Danzig is a country located in the Prussian region. It doesn't exist in the 1444 start, although it exists from 9 August 1807 on. It can also be released as a vassal from the Teutonic Order or formed from rebels. During the event chain "Prussian Confederation" it represents the confederation and will declare independence from the Teutons, however, it will immediately be vassalised by Poland after the war. As a country with Prussian primary culture Danzig can form Prussia. 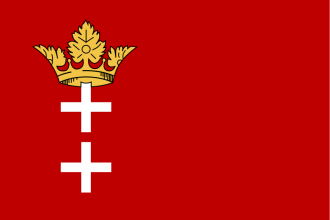 Danzig can also re-establish Poland if Poland and the Commonwealth do not exist. The kingdom that the Piasts once worked so hard to reunify is now divided and without a king. We must strive to unite the Polish people and create a Polish nation to take the place of the kingdom that once was. Has not yet made this decision. The Commonwealth does not exist. Is not the Papal State, the Holy Roman Empire or Poland. has Polish or Silesian as primary culture or is Danzig. it must own at least 6 provinces. Krakow (262), Warszawa (257), Poznan (254), Kalish (255), Sieradz (258), Sandomierz (259) and Leczyca (1939). then all owned provinces are removed from the HRE. Gains permanent claims on all provinces of Poland (region) that are not already owned. Changes primary culture to Polish. Danzig is an incredibly valuable province because of its trade bonuses (Danzig can very easily be the dominant trade power in the Baltic Sea Trade Node). Because of this, Pomerania, Poland, and the Teutonic Order will do everything within their power to annex it. Survival will be Danzig's greatest priority. If released as a vassal from the Teutonic Order, Danzig will need to improve relations with nations that will be willing to support Danzig in a war of independence against the Teutonic Order. Once independent, Danzig's greatest threats will be Poland and Pomerania until the truce with the Teutonic Order ends. For this it can be greatly beneficial to improve relations with Austria and become part of the Holy Roman Empire. This will bring Austria to defend Danzig if Poland or the Teutonic Order attack. This will make it less likely for Poland or the Teutonic Knights to attack early on, especially as they will concentrate on fighting each other instead. Alliances with Austria, The Hansa or Brandenburg will help defend against Pomerania. Due to the great trade bonuses of the Danzig province, the Danzig traditions, and national ideas, Danzig's focus should be to build up trade power in the Baltic. The easiest expansion possibility is annexing Pomerania, but depending on Danzig's allies the Teutonic Order is also a possibility (with the added bonus that their provinces are within the Baltic trade region). Once this is done Danzig should have a wealthy trading state, with great opportunities for expansion following similar strategies to those of Pomerania or the Teutonic Order.